Here is an exercise, that is a variation of the exercise on page 34 of "Not For Ourselves Alone", edited by Burton Carley and Laurel Hallman. Take a blank sheet of paper and lay it in landscape mode before you. Where do your deepest motivations come from? External denotes that sense that it come from outside of yourself. When Isaiah heard the voice of God calling him to prophetic mission, he understood that as a call from outside of himself. It was God, who was wholly other to him. The people of the Bible who were called by God, usually resisted that call, it was so strange and external to them. These are the classic stories of "The Call." But what about other people? Some are pulled into ministry by the compelling demands of circumstances, or of history? Do you feel called by an external force? It doesn't have to be the God of the Bible, but was from some source outside of you? 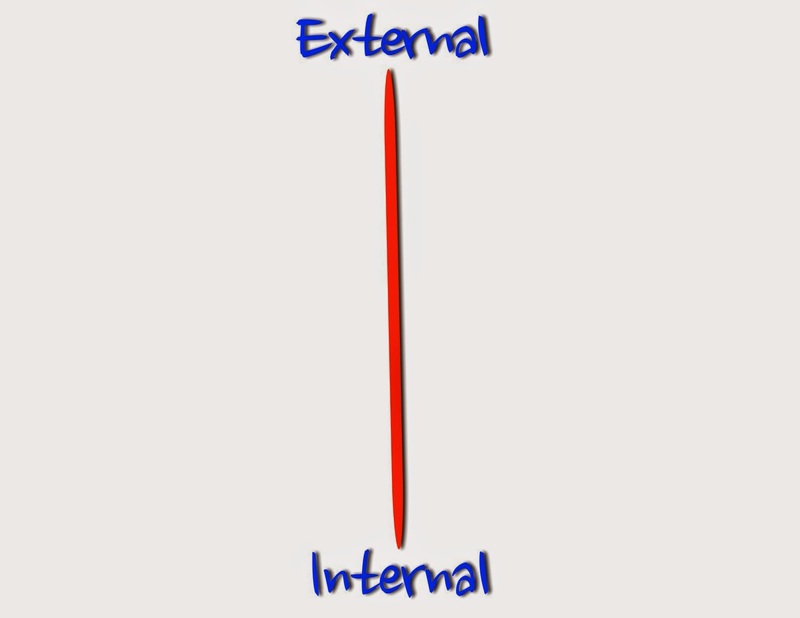 Internal describes a different process. When a person understands their motivation toward ministry as having come from deep within themselves, their own personal history, or their own psychological needs, or their DNA, that is an internal source. "Ministry is something that I just needed to do to be true to my real self." Is that you? It's a continuum, of course. People are called by other people, by family members, by their congregations, by their own responses to external situations, by the spirit within. Some might say it's just the ebb and flow of brain chemistry. Where on that vertical axis would you place the source of your deepest motivations toward ministry, your "Call? Find yourself on that vertical line.